“The Green Dragon Racing Team arrived in Alicante this morning after our 1500-mile delivery trip. Compared to the 2000 mile qualifier, which was rough, wet and all in all a pretty brutal trip, this was a slightly different experience. Somehow you can never relax on these boats not least as much of the sailing is done in the pitch black with no idea of what dangers lay ahead. Last night we spent five hours dodging commercial shipping as we tacked our way through the Straits of Gibraltar into a 35-knot headwind. The day before we had to slow right down to clear a sunfish off the port rudder. Life onboard is tough; the trimming, hoisting, lowering and moving sails drains every ounce of energy that you have. 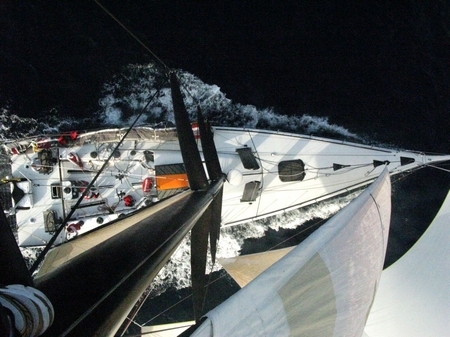 We sail in watches with four people on deck plus two of us on standby, while four people get to rest. It is four hours on, two on standby and two hours off in every eight, if you are lucky. Everybody gets up for any tacks, gybes and heavy air sail changes. All of the food is freeze dried, and there is little respite from the constant motion and intensity of the boat. So why on earth would anybody choose to do this? 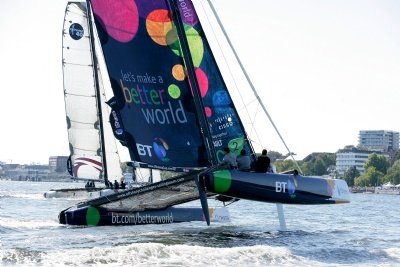 The answer is simple – it is a chance in a lifetime to be part of an incredible sporting event and to pitch ourselves against some of the best sailors in the world – we all want to win. We have a fantastic team both ashore and afloat, and we will share life-changing experiences over the next 10 months. Yes it will be unbearably hot, yes it will be unbearably cold, and at times it will be dangerous. And yes, this will certainly be the biggest test of our lives. It will also be an incredible journey for everyone involved. Position at 2100 29th August HST, 0700 30th August UTC: 21 29.065’N, 156 25.950’W. This afternoon, as the clouds of a squall passed away, I glanced over my shoulder and saw land – the first land I’ve seen since I rowed past the Farralone Islands just west of San Francisco. That was on May 26th, many miles and several watermakers ago. I was seeing the cloud-shaded outlines of Maui and Molokai, two of the Hawaiian islands that lie between the Big Island and my destination of Oahu. In the aftermath of the squall the ocean was hushed and still, as often happens for a while after short sharp shower, before the weather recovers itself and the wind starts up again. Today that hush felt like a very special, quiet moment, a time for recollection and reflection before the end of this great adventure. I am now well into the last 100 miles and have just two or three days of solitude remaining before I make landfall. HERNDON, Va., Aug. 29, 2008 (GLOBE NEWSWIRE) — Northrop Grumman Corporation (NYSE:NOC) has appointed Donald E. McHugh Jr. vice president and controller of its Technical Services sector, and David Reith director of business operations and chief financial officer of National Security Technologies LLC (NSTec), located at the Nevada Test site, of which Northrop Grumman Corporation is the managing partner. 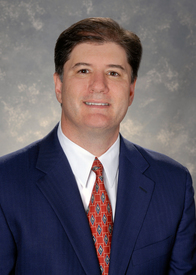 McHugh has served in financial, operational and project management positions in Northrop Grumman since 1981. Most recently, he served as the chief financial officer of the Civilian Agencies Group in the company’s Information Technology sector, where he was responsible for all traditional budgeting, regulatory compliance, financial planning and group accounting functions. 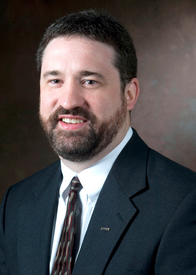 David Reith, director of business operations and chief financial officer of National Security Technologies LLC (NSTec), of which Northrop Grumman Corporation is the managing partner. Reith joined Northrop Grumman in 1987 and most recently served as vice president and controller of Northrop Grumman’s Technical Services sector. He has held a number of increasingly responsible finance and business management positions at Northrop Grumman, including business manager for the transition and integration of Litton operations into the company’s Electronic Systems sector and controller for the company’s Shipbuilding sector. 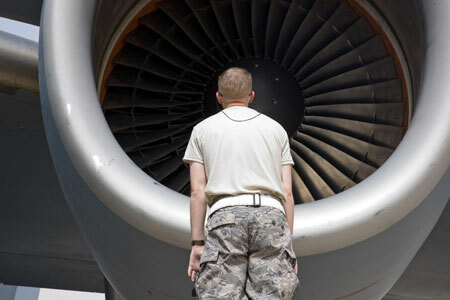 ST. LOUIS, Aug. 28, 2008 — A U.S. Air Force maintenance crew chief inspects an engine on a Boeing [NYSE: BA] C-17 Globemaster III at an air base in Kuwait. A C-17 takes off or lands in Iraq or Kuwait at least once an hour as part of ongoing military activities. The aircraft delivers vital cargo and troops throughout the region while battling harsh weather conditions. High temperatures, sand and dust storms are a constant threat to engine performance. Air Force maintenance crews work closely with Boeing field service representatives to ensure the aircraft are mission-ready. Space shuttle Atlantis is on schedule to be rolled out to Launch Pad 39A at NASA’s Kennedy Space Center in Florida on Tuesday after technicians resumed normal connection work to fasten Atlantis to the external fuel tank. Rollout will begin at 12:01 a.m. EDT. A shuttle interface test will be conducted over the Labor Day weekend before Atlantis is cleared to roll to the launch pad. 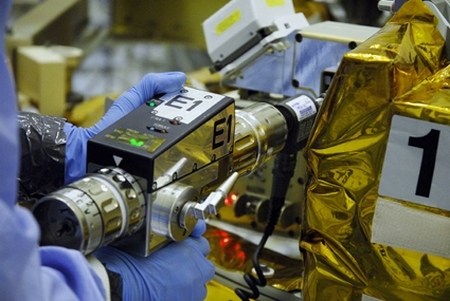 The shuttle and its crew of seven astronauts will upgrade key components and install state-of-the-art instruments on NASA’s Hubble Space Telescope during Atlantis’ STS-125 mission. 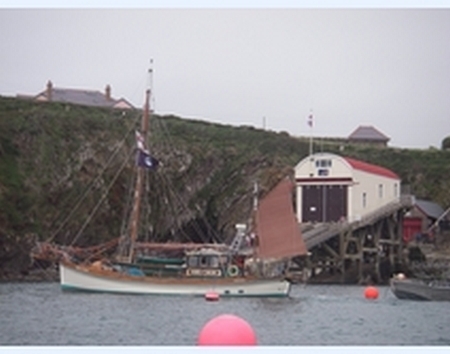 On Wednesday (27th August) a welcome visitor to St David’s RNLI Lifeboat Station, was the Swn-y-Mor – a 46ft Watson Class Lifeboat which had served at St David’s from 1936 until 1963. 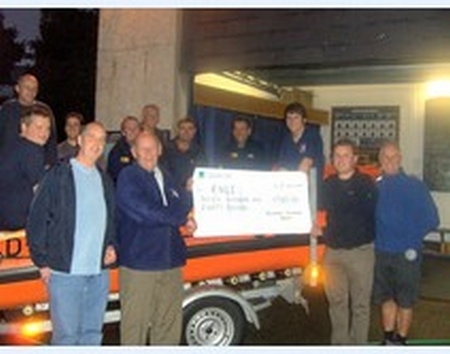 She was donated to the RNLI by the Civil Service Lifeboat Fund at a cost of £7,618. She was not of the self-righting design, and during her time on service launched 90 times saving 108 lives. During the war years among the rescues performed was one in particular was a search for survivors from two landing craft, which were overwhelmed in rough seas off Milford Haven. 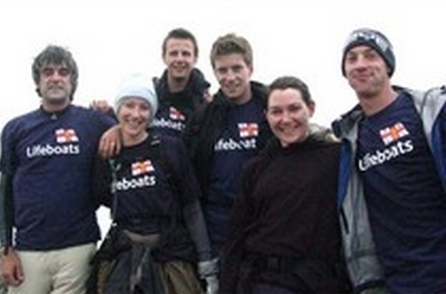 The RNLI has wholeheartedly congratulated a group of south east people who discovered that raising funds for the charity can literally be an uphill struggle. A total of 15 people from across the region took part in a gruelling sponsored event earlier this year when they climbed the three highest mountains in the United Kingdom, and all within a 24-hour period. On Wednesday evening (27 August), Horton & Porteynon RNLI Lifeboat Station was presented with a cheque for £780 raised by the Swansea Outdoor Group. The group made up of people from the South Wales area, raised funds for the RNLI by encouraging people to sponsor them to walk various distances of up to 30 miles. 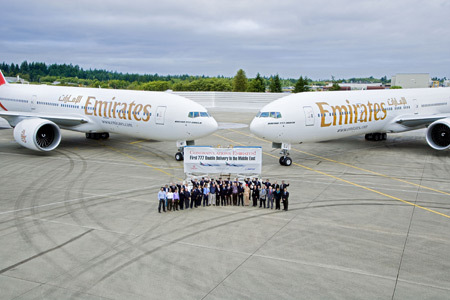 SEATTLE, Aug. 29, 2008 — Boeing [NYSE: BA] and Dubai-based airline Emirates celebrated the delivery of a 777-300ER (Extended Range) and a 777-200LR (Longer Range) Thursday, marking the first double 777 delivery to a Middle East airline. Representatives from the Emirates and Boeing team are pictured here prior to the airplanes’ departure for Dubai. These new 777s are the 62nd and 63rd of the model type delivered to Emirates, one of the world’s biggest operators of the most successful large twin-engine airplane flying today. To date, 56 customers from around the world have ordered 1,092 777s. Boeing has more than 355 unfilled orders for the 777, worth more than $91 billion at current list prices.